You are currently browsing the Archaeofacts.com archives of Musings for the day Monday, April 1st, 2019. Pretty expensive to buy all those shrouds and send a crew around tying them on. Must be a business deal negotiation snafu and not an April Fools’ hoax—my bet, anyway. Have you ever seen this edge detail on pine straw? I watched a guy do it several years back, a nice little flick of the wrists after he caught the errant needles with a shovel. 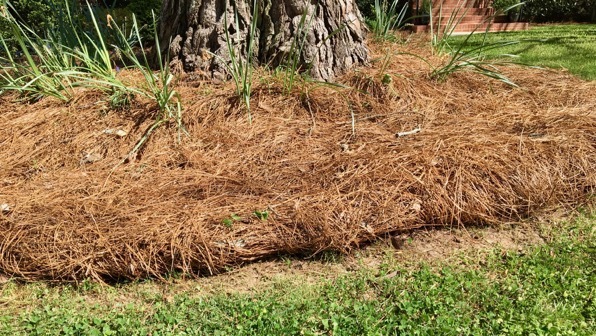 I think it’s to keep the pine straw neater, but also to give them an edge that the yard-guys can preserve when they use a mower and blower. Culture today, and no flower. Heh.